What’s glamping, you ask? Well, in my opinion, it’s camping without the dirt. That’s right, after two nights in a vintage glamper, despite not having taken a shower, I didn’t feel nearly as dirty as I do after two nights of crawling in and out of a tent — and that’s just one of the benefits of glamping. 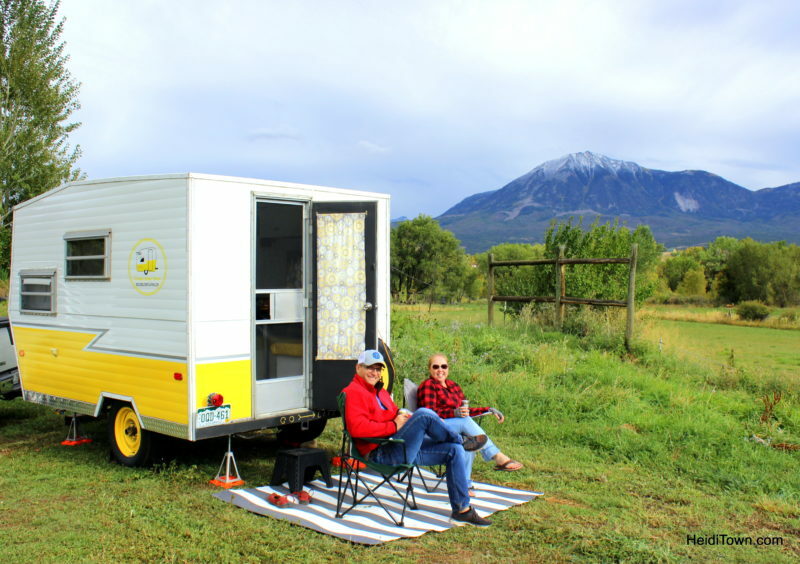 Buttercup is a renovated 1969 Go-Lite, and she’s just one of Rescued Relics’ glampers. 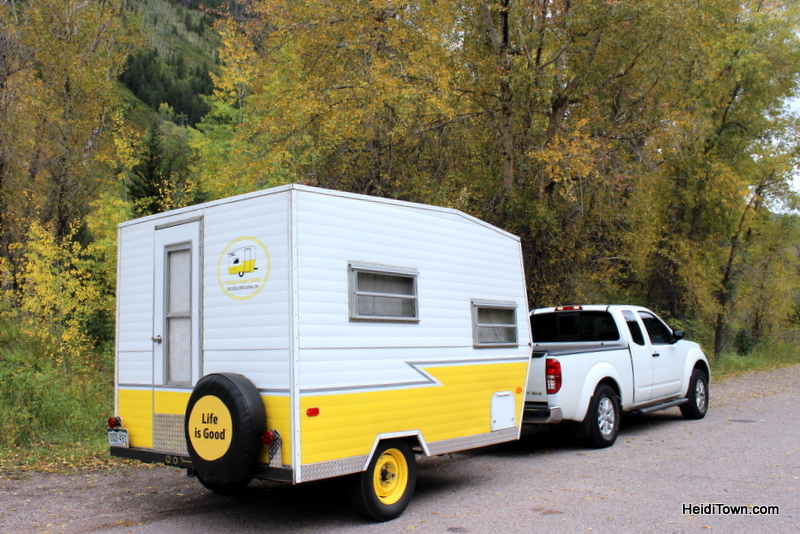 At 10 feet long, she’s equipped with a bed, table, kitchenette with propane stove, refrigerator and storage. Quite frankly, I think she’s pretty much the cutest little glamper (camper) ever. We pulled Buttercup with Ryan’s Nissan Frontier and one of the drawbacks of pulling a camper is that you need to drive a reasonable speed which is not Ryan’s normal style, but he soon got into the rhythm of things. He often pulls U-Haul trailers and he said Buttercup was as easy to pull as one of those. Beware that if you are traveling with Buttercup or any of Rescued Relics’ campers, strangers will approach anytime you stop. We didn’t get away from any gas station during our 600-mile round trip adventure without having a conversation about Buttercup with a stranger who was intrigued by her. One bonus of pulling a camper is that we had a built-in lunch spot in the kitchenette. 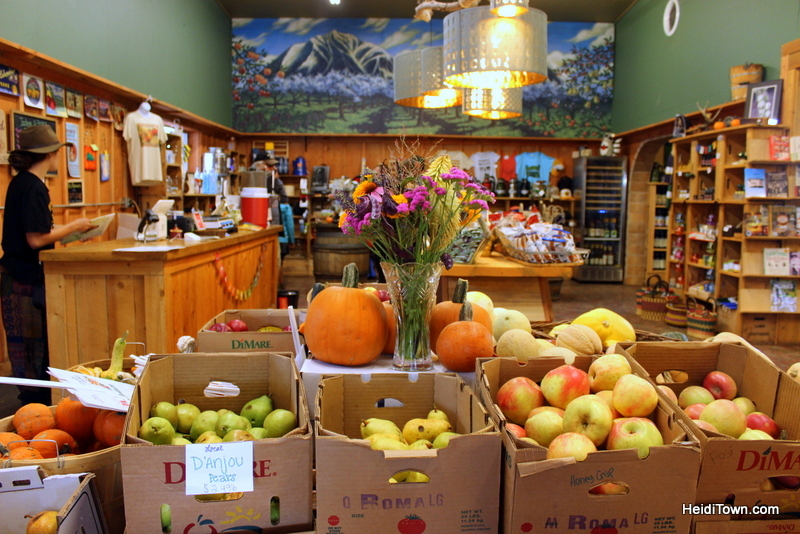 On our way to Mountain Harvest Festival in Paonia, Colorado, we stopped for sandwiches at City Market in Eagle and ate them at our “dining room table,” which was much more preferable than eating them in our laps in the cab of the pickup. Perhaps a bit oddly, having a table to sit at was a highlight of the entire trip, especially since we endured one very rainy day – it’s the little things. Enjoying lunch in the parking lot of City Market. We pulled into Delicious Orchards, home to Big B’s Hard Ciders, Juices & Vinegar on Friday afternoon. 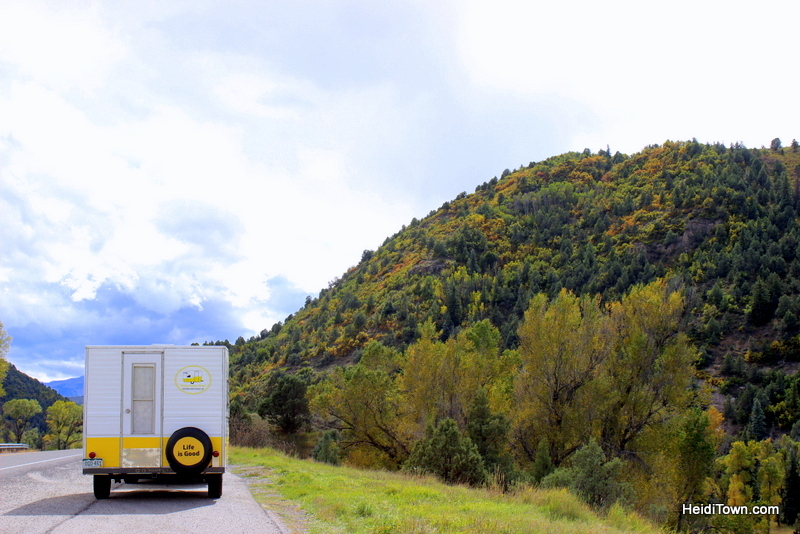 We’d taken the lovely fall route through Carbondale and over McClure Pass. During area events, Delicious Orchards lets folks camp on their property and I’d gotten the okay to park Buttercup on the back of their property for the weekend. The view from our glamper campsite at Delicious Orchards. Delicious Orchards is one of my favorites spots in the world. 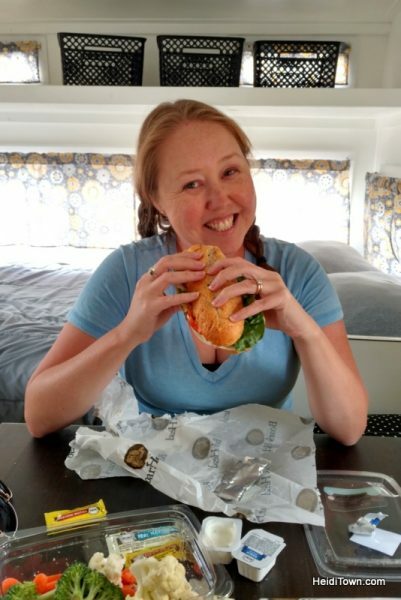 Anytime we’re visiting the North Fork Valley we stop here several times, but this was our first experience camping on the property which features the orchard and a farm store, cider tasting room and restaurant. They have porta-potties and a bathroom available to campers, but there are no hookups or showers. 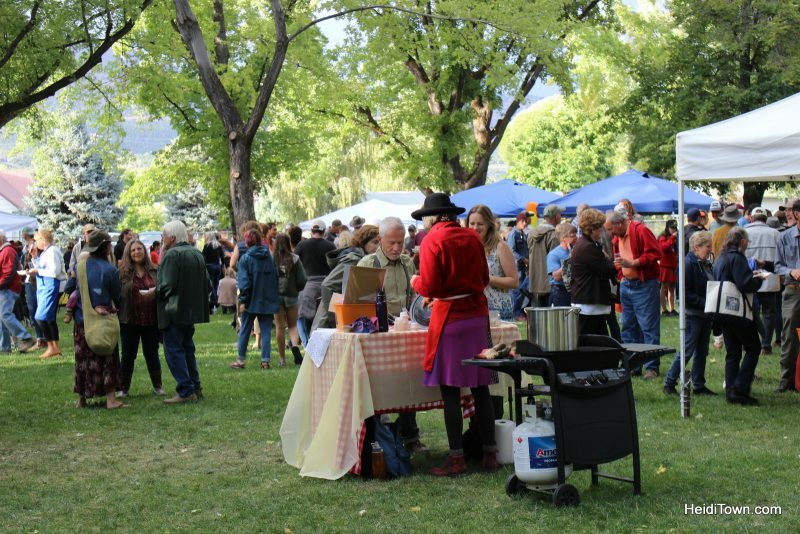 Located just minutes from Paonia and minutes from Hotchkiss, Delicious Orchards make a great home base for attending a local festival. And, as an aside, they have their very own festival coming up on the property. 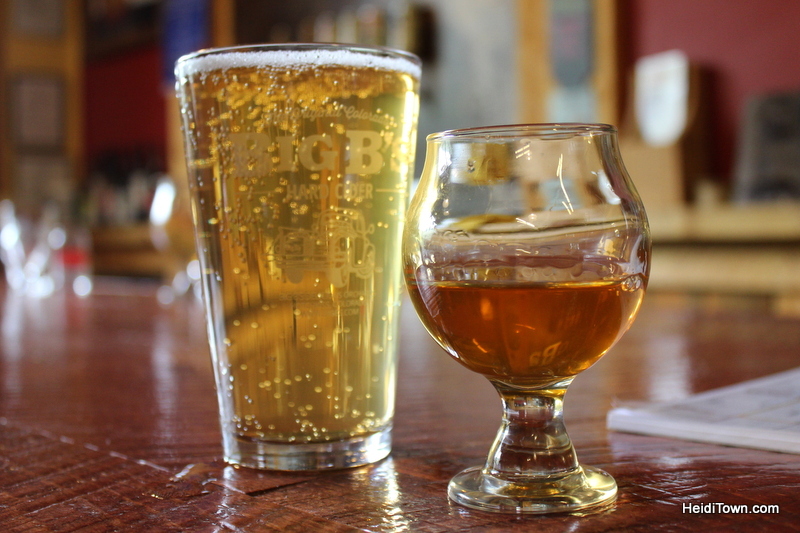 Hard Cider Fest is October 28. Learn more here. 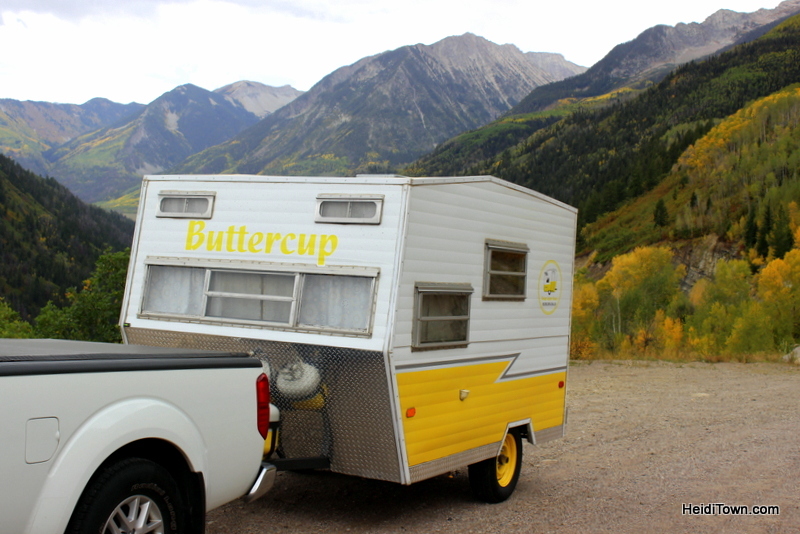 Hanging out with Buttercup the camper rental from Rescued Relics at Delicious Orchards in the North Fork Valley during Mountain Harvest Festival. 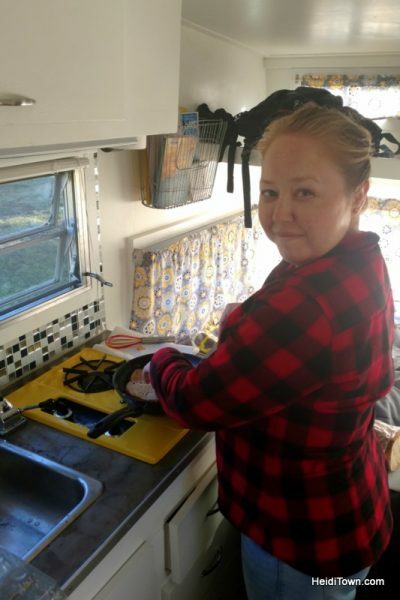 After setting Buttercup up, which is fairly easy, especially when you’re married to a guy as handy as my husband, we headed into Paonia to attend the Chili Cook-Off, a tasty tradition at Mountain Harvest Festival. It didn’t disappoint and we ate our way through more than a dozen great chilis, many made with homegrown ingredients. Chili Cook-off at Mountain Harvest Festival 2017. If you’ve been a longtime reader of HeidiTown you know that the North Fork Valley is tops in my book. 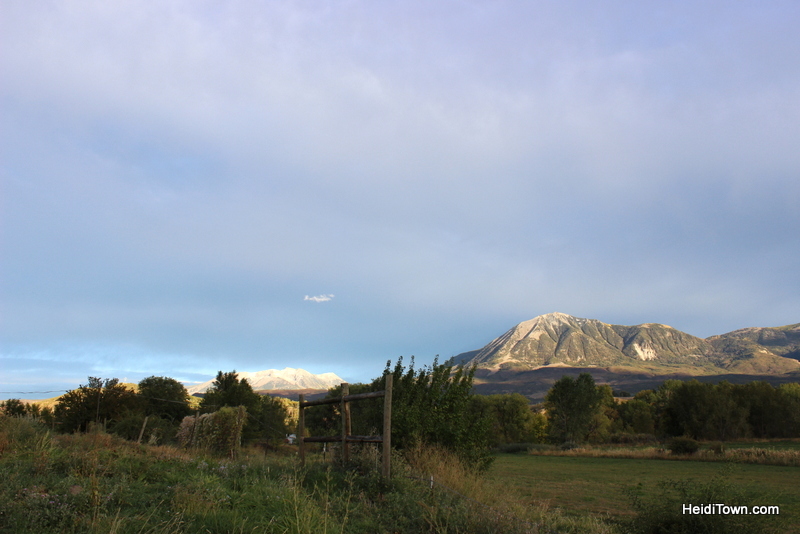 Its small farms, fields of sheep, vineyards and friendly locals make it one of the best places in Colorado to unwind. Rain started to fall at some point that first evening and it didn’t let up until the following afternoon. This made Buttercup essential to enjoying this trip (if I’d been tent camping I wouldn’t have been a happy camper, no pun intended). Ryan enjoying a little bit of down time on this very busy trip. Buttercup is not equipped with a bathroom, but a short walk through the orchards was a small price to pay for having a snug little glamper to sleep in and the bed is very comfy. I’d always say “hi” to the ladies on my way to the restroom at Delicious Orchards. I’d be remiss if I didn’t mention our late night dinner at The Living Farm Cafe. 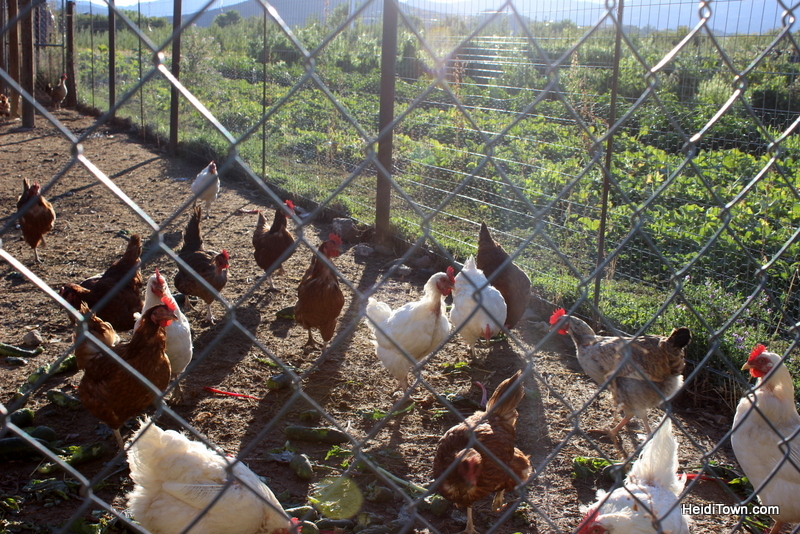 I’ve previously written here about my love affair with The Living Farm, The Living Farm Cafe and The Living Farm Inn. The next day, we breakfasted at Berg Harvest Mercantile, a place we discovered on our last visit to the North Fork Valley. We ate our freshly made food on their open-air patio listening to the rain and watching the fog crawl over the hills around us. Love from one of the farm dogs at Holy Terror Farm. 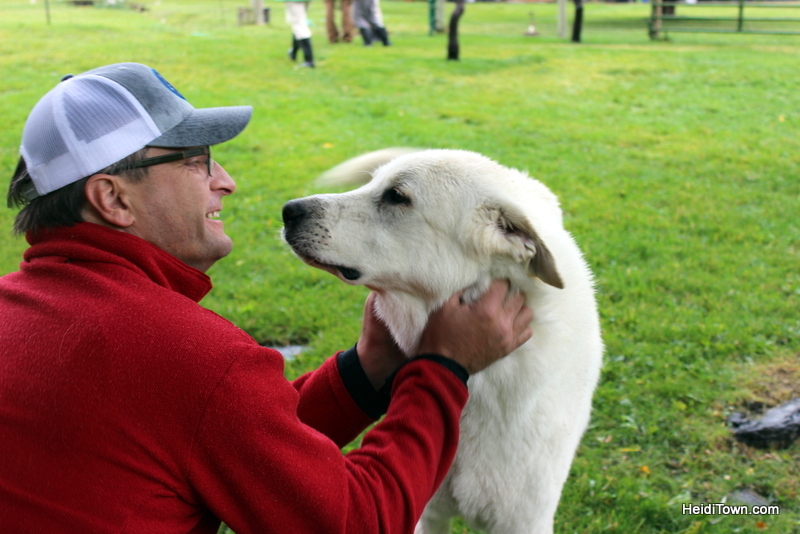 Despite the rain, we participated in one of the farm tours set up by Mountain Harvest Festival and even in the dreary weather it was a fascinating outing. I highly recommend touring Holy Terror Farm the next time you’re in the area (call ahead to arrange a visit). That afternoon we returned to Delicious Orchards for a pig roast and cider. Awesome bands played on their permanent stage all weekend and will do so again during Hard Cider Fest. In the evening, after sharing a delicious pizza at Louie’s Pizza, we attended Saturday Sundown Swing, a musical extravaganza that happens in downtown Paonia as part of Mountain Harvest Festival. Bands and solo artists play all over town and we had an absolute blast going from venue to venue to take in the sounds of Paonia. It was actually even better than I had hoped and I was exhausted from dancing when we returned to Buttercup for the night. Sadly, we had to leave the next morning, but not before I cooked up a delicious breakfast of farm eggs I’d brought from home, bread from The Bakery at Small Potatoes Farm and fancy butter from Delicious Orchards’ market. Simple, delicious and fresh. We enjoyed a colorful drive home over McClure Pass. The colors along the crystal river were really starting to pop and I loved the way Buttercup fit into the scenery. 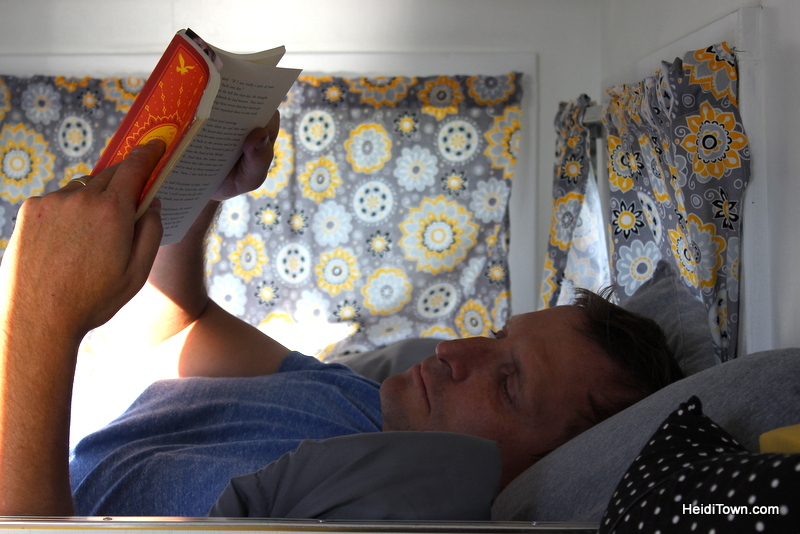 A retro camper is a fun, alternative way to travel and if you can find a venue like Delicious Orchards, even better. I was saddened to hear this news last week, but if you’d like to experience an outing with Buttercup or one of their other campers you have until the end of November 2017 to do it. 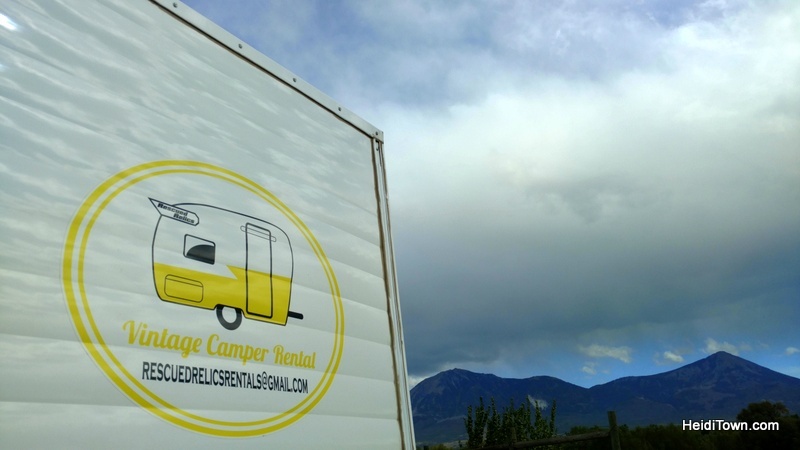 In addition, Rescued Relics will be selling their campers, so this is your chance to buy a piece of history. Nothing says “road trip” quite like one of these cuties. Please note: If you’re worried about November being too cold for glamping, Rescued Relics’ glampers have propane heaters to keep you nice and warm. See photos of the inside of Buttercup here. Please visit RescuedRelicsRentals.com soon to book your outing or to schedule a viewing of their colorful fleet. 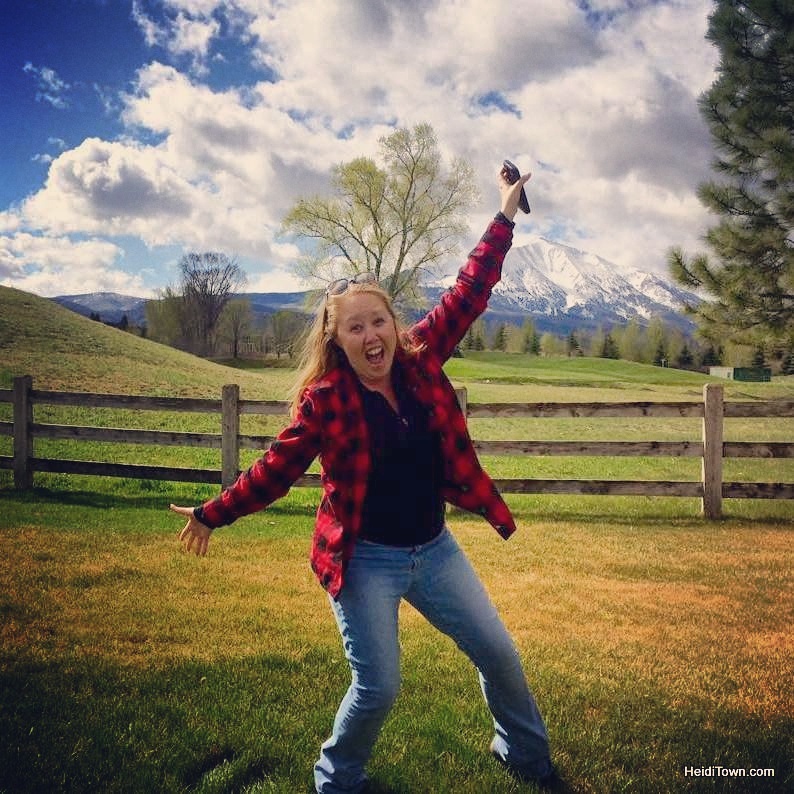 Camping without dirt really isn’t camping… JK, looks like a blast! We’ve been saying that we’ll get a camper when we turn 50, but it’s keeps looking more and more tempting. That camper is so stinking cute! 50-smifty. I’m telling you that beds rock whether you’re 25, 35, 45 or 55. They always rock. It was really great and you know how much I hate rain! The rain actually made the sunshine that much better on this trip. Thanks for dropping in on HeidiTown today, Karen!